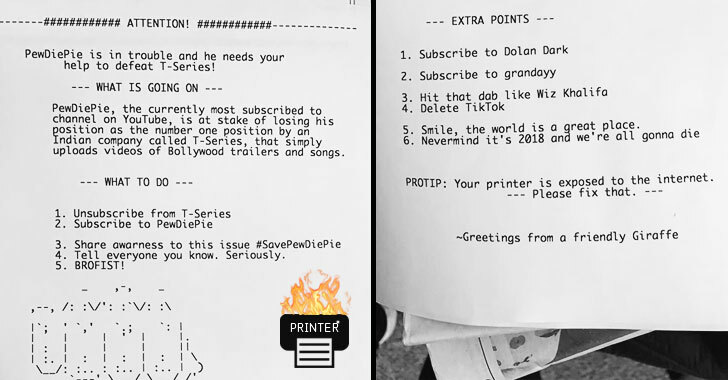 The war for "most-subscribed Youtube channel" crown between T-Series and PewDiePie just took an interesting turn after a hacker yesterday hijacked more than 50,000 internet-connected printers worldwide to print out flyers asking everyone to subscribe to PewDiePie YouTube channel. From this fear that PewDiePie won't remain the number one most-subscribed YouTuber in the world, an anonymous hacker (probably his die-hard fan) with the Twitter username "TheHackerGiraffe" came up with a hackish idea. Though it's a nice trick to raise cybersecurity awareness and consequences of leaving vulnerable printers exposed online, law and information security experts do not recommend other white hat hackers to participate in such stunts.